Before doing this post, I had only ever had taquitos from the freezer section. There are not very many frozen foods that hold a special place in my heart, but taquitos are one of those foods. My husband and I often ate taquitos during out college dating days (cheap meal!) and the taste of them still brings back happy memories. Although I would be perfectly happy eating freezer taquitos for the rest of my life, I had to try a homemade alternative to see if I could capture the crunchy succulence of the frozen original. Also, I had a suspicion that homemade taquitos would be lower in fat, sodium, cholesterol and all those other pesky dietary evils that we never worried about in college! Below is my recipe for homemade spicy beef and cheese taquitos that attempts to capture the magic! I compared these to El Charrito brand frozen Beef and Cheese Taquitos. 1. Preheat oven to 425º. Spray a large sheet pan or cookie sheet with non-stick cooking spray. Heat tortillas in the microwave for 1 minute or until warm and pliable. 2. Spread one Tablespoon of shredded beef and 1 Tablespoon shredded cheese on the bottom third of each tortilla then roll them up tightly. Place, seam sides down, on the prepared baking sheet. When all of the taquitos are filled, spray the tops lightly with cooking spray. Bake in the preheated oven for 15 minutes or until the tortillas are lightly browned and crispy on the edges. Serve immediately with toppings of your choice. This recipe could also be made on the stove top in a dutch oven. In that case, the heat would need to be kept very low and you might need to add more liquid during cooking to prevent it from drying out or burning. If made on the stove top, cook on low heat for about 2 hours. 1. Pat the beef dry and season on both sides with salt and pepper. Sprinkle the chili powder evenly over both sides of the meat and rub the salt, pepper and chili powder into the meat. 2. Heat the oil over medium heat in a skillet. Add the meat and cook until browned, about 3 minutes per side. Transfer the browned meat to a slow cooker and pour the salsas and broth over the meat. Cook on high heat for 3 hours or low heat for 4 to 5 hours, or until meat is very tender and shreds easily. Check slow cooker occasionally and add extra broth if beef is drying out. 3. Remove the beef from the cooker and shred with a fork. Pour the extra sauce from the slow cooker over the meat along with the lime juice and toss lightly to combine. Chill until ready to use. Keeps for a few days in the refrigerator. In this comparison, the homemade version definitely took much more time and effort to make. Most of that time went into braising the beef which is a very hands-off, but time consuming process. The actual filling and baking of the taquitos only took about half an hour, but that is still 3 times longer than it takes to bake a handful of frozen taquitos. The homemade taquitos also cost 3 times as much as the frozen variety. The meat alone cost more than a whole box of 18 frozen taquitos, meaning that the frozen variety wins hands down on both effort and cost. Was the final product worth the extra time and money? Maybe. I guess it depends on who you are feeding and when. If you’re looking for a quick snack, then homemade taquitos are obviously too time consuming to prepare, even if they do have better flavor and a meatier texture. However, the homemade taquitos are a very fun main dish for dinner (which is how we ate them) served with dipping sauces and some spanish rice. 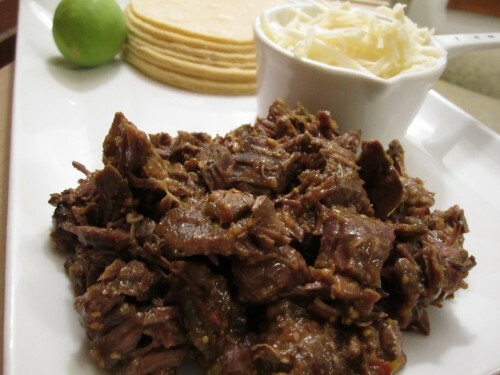 The beef filling can easily be prepared the day before and then all that needs to be done is to fill and bake the taquitos making this an easy dinner choice. 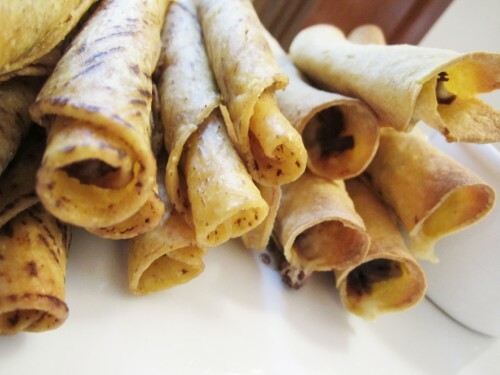 The homemade taquitos were cheesier, noticeably more flavorful and the meat had a nice, firm texture. However, it must be admitted that the frozen taquitos were also pretty darn tasty. The meat was a bit chewier than the homemade variety, the cheese barely noticeable, the flavor salty than spicy, but they still had that crunchy appeal that I remember from college. Bottom Line: Homemade taquitos were definitely a fun experiment that I will be repeating and they had fantastic flavor. They would make a fun, quick dinner if you had shredded beef already on hand. However, there is no comparison on either time or cost to the frozen variety, especially if you have to make the beef filling from scratch. Therefore, frozen taquitos are still the best choice for a quick, cheap snack (if not a healthy one).